This paper discusses the creation and development of the Survivor Focus Group at the Sydney Jewish Museum (Sydney, Australia). It lists the reasons for its initiation, as well as its development over an eight year period (See Appendix B). The words and feelings of the participants (in bold type and quotation marks) are a special and meaningful inclusion. Note that this paper is not, and never was, a formal research study. Rather, it is a narrative of the group’s evolution and development. The ideas of Irving Yalom (1975 & 1980) and Dr Judith Herman (1983) were incorporated into the group’s nurturing environment over the years. Organizations considering the formation of such a group will be able to extract ideas of “do’s and don’ts” as they read this paper. The Sydney Jewish Museum’s Survivor Focus Group, a group of our Survivor Volunteers who meet every second month at the Museum, is unique in the world. We are fortunate to currently have 32 active Holocaust Survivors Guides who tell their stories. They share their histories with school students of all ages, tertiary students, home-schooled students, Jewish and non-Jewish hospital staff, trainee staff of health agencies, teachers, university lecturers and high-ranking police officers. How did ongoing “guiding” affect the Survivor Guides in the museum and in their private lives? How could the museum protect and encourage the guides to age well, given their traumatic pasts, while remaining active participants in the museum? Would it be beneficial for them to belong to a safe ongoing group? What role would the facilitators have in such a group? What would be the most thoughtful and empathic exit from museum “guiding”, should the survivors choose to or be required to do so? explore the long-term effects of “guiding” on the guides themselves. As a result of these meetings, Renee Symonds and Rony Bognar saw that a Survivor Focus Group would greatly benefit these very special volunteers of The Sydney Jewish Museum. Its formation was seen as a provision of responsibility and duty of care to their volunteer Survivor Guides. With seed funding from the JCA (Jewish Communal Appeal – a State-wide partnership with 22 organizations for fundraising and support purposes), the Survivor Focus Group was established. Many of the survivor volunteers were reluctant to join the group initially and assumed that this group was going to “counsel” them about their traumatic experiences. In fact, the group members still call it the “focus-pocus group,” implying some unconscious and magical impact. This was not the intention, nor was it the result of the group. It is interesting to note that during the group, members only ask “Have we got Focus today?” They never identify the purpose of their meetings as being anything else, as if there is a regular need to have a focus on themselves and their history. This volunteer group was, and still remains, committed to the “duty” they feel about “telling” their story while respecting and confronting their memories. The group’s participants share many aspects of their personal lives with each other, which are not only Holocaust related. The group is a “safe place” in which to open up and share their feelings and experiences. Within the group, there is a complex mirroring process of cohesion and intimacy between the members. Our group is characterized by each participant extending themselves to others, being able to accept what others offer with compassion and tolerance. Each two hour meeting, held in the museum’s classroom space, also acts as a protective boundary. It acts as a filter to reassess the survivors’ resilience and ability to keep volunteering, thereby assisting in extending their longevity as guides by ensuring that they are not alone in this highly emotional process of telling their story. The museum and the community continue to derive great benefit from receiving their first-hand testimonies. Their role is to explore the issues and concerns of the participants in a confidential and empathic environment. Differences of opinion within the group are accepted and tolerated in a protective and welcoming environment. This might include ensuring that each survivor knows that their personal story is unique. Their role includes allowing survivors to talk about their stories and suffering while ensuring that discussion then moves on to their survival and life achievements. The most significant development has been a shift away from a directed group to a self-directed group (c. 2010). It is important that conflicts within the group do not become traumatic events and that there is no enacting of the roles of perpetrator, accomplice, bystander, victim or rescuer. The group’s structure must protect all against any traumatic re-enactments. The participants often express their gratitude to the facilitators for creating and upholding this environment. They feel cared for by responsible facilitators, engaged in shared leadership, providing a haven of safety in a trusting climate. The greatest privilege for each survivor and for the facilitators is that they share a part of themselves. “Listen to our survivors and listen well, they have more to teach us than us them.” (Krystal, 1978). The participants of the group determine the issues they wish to share and discuss. This has helped the survivors “override” the daily pain of their memories, by taking ownership of the group. The sustained engagement in the group and the developed friendships have helped bond the group tightly. In 2010, the group expanded by welcoming the participation of all current volunteer survivors at the museum. Previously, this group had been restricted to volunteer guides only. To mark the 20th anniversary of the museum in 2012, the group expressed a need to “send a message” to future generations. This project was enthusiastically developed and embraced, resulting in a pamphlet containing individual messages from the survivors. This gave them the opportunity to express their inspirational thoughts, as well as to find comfort in the knowledge that they were not alone. The Survivor Focus Group also initiated the “Remember Me” program in 2012. The idea for the program came from one of the group’s participants and its purpose was to give the Jewish and non-Jewish communities the opportunity to hear a story of survival. Once a month, a survivor would address an audience of up to 200 people at the museum. Advertising for this program reaches the general public as well as the Jewish community. The audience is asked to commit to remembering the speaker. A pocket-sized card with the individual survivor’s photo and signature is given to everyone who attends. The audience, in turn, is asked to sign the card and keep it to remember the survivor. Today, this is one of the museum’s most successful programs. This year, a 96 year old participant of the group wanted and needed to tell her story publicly for the first time through the “Remember Me” program. This was another truly amazing and rewarding achievement for this survivor to speak out to a capacity audience of 200 people. 3) An ability to feel trust in the other person and withdraw trust when not feeling that trust. This process was a huge task for survivors that incorporated creating a new identity by having life initiatives and allowing for deepening relationships. When the survivors had children, they had to consider how best to share their traumatic story, or to remain silent. What was also critical for some later on was to find a way of making use of their experiences and horrific memories to educate the public so that such atrocities would never occur again. 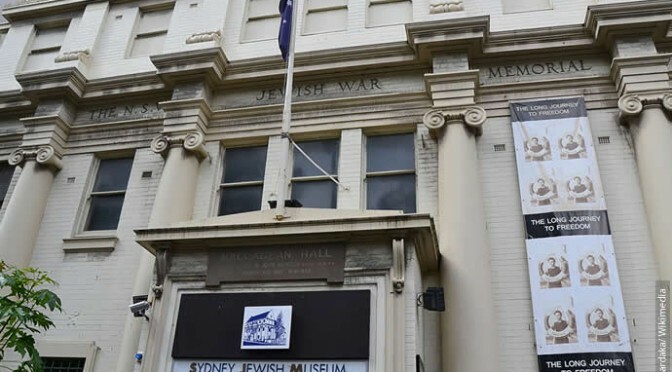 Survivors gained strength from early participation in meaningful Holocaust remembrance events before the Sydney Jewish Museum opened its doors in 1992. To be able to stand up in public and speak their truth without fear of consequences was another achievement. For our Survivor Focus Group there was and is a “joy” in the knowledge that evil has not prevailed and that they have survived, produced families and new generations. The resolution of their trauma can never be final and their recovery can never be complete (Herman, p211), as there will always be a “resurgence of traumatic memories (Herman, p212).” We know that traumatic memories never vanish. In considering the uniqueness of each survivor and their survival experience, the facilitators had to ensure that no participant was isolated or alienated by the formation of the group. Irving Yalom wrote widely about groups, indicating the adaptive spiral most powerfully occurring in a group setting (Irving Yalom, The Theory and Practice of Group Psychotherapy, 1975, p 216), explaining that group acceptance increases each member’s self-esteem and that survivors do better in groups than in individual therapy. The idea of telling one’s story within the group has the public testimony aspect of one’s history being witnessed. A group can help the individual to enlarge his/her story from isolation into the fullness of the larger world. Many are able to take emotional risks, perhaps beyond what they believed they were capable of. We do not aim at uncovering trauma, yet if it happens to surface there is trust and space to address all issues. The group is supportive, not trauma focused. We address the common aspects of life; we provide a place for each member to be known by their name and not by a number. A brochure: A collection of individual contributions to future generations in the form of messages to honour remembrance. The brochures are distributed widely, and are also sent to all school groups that visit the museum and that attend museum functions. A book of poetry and verse: It is entitled “What the Group Means to Me.” Heartfelt comments were expressed with humour and charm. The Remember Me Program: See Appendix A. Several articles: These were written about the Survivor Focus Group in Jewish publications. An article written in the Good Weekend Magazine: This article appeared in an Australia-wide newspaper (Harari, 2013). It detailed two of the group participants’ Holocaust experiences as well as defining the group’s purpose. Several participants were invited to speak in the wider community: Most recently, a Survivor was asked to be the key note speaker at the Shoah Commemorations 2013 in Hong Kong. Several of the participants of the group have received prestigious awards: Some awards were presented by the Australian Government for their services to Holocaust education. Within the group, we have travelled through the trauma to a place of recovery in Dr. Judith Herman’s terms. Answering the title of our paper “Do we have Focus?” we must say a resounding YES! From their knowledge, wisdom and diversity of experience, the survivors have been able to use their creativity and resilience in constructing their post-Holocaust lives. Much physical, mental and emotional scaffolding had to be erected. Survivors have answered as much as they are able to about their past and now it is about their future. This requires refocusing their lives on the external, their social connections and daily satisfaction. Our Survivor Focus Group supports them in this desire at this stage of their lives. Where to next? We must go where the group leads us! Humour, camaraderie, sadness, pain and reflection accompany our journey. The duty expressed is not to be silent, but to be courageous and pass on what was lived and witnessed. Harari, Fiona (2013). The Last Survivors. The Good Weekend, in The Sydney Morning Herald, April 6. Krystal, H. (1978). Trauma and effects. The Psychoanalytical Study of the Child, 81-116. This is a double-sided card.